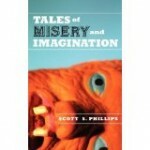 I “met” author/screenwriter Mike MacLean through Facebook when The Other Scott Phillips posted a link to the trailer for Sharktopus. After the amazing Internet buzz for that movie, I wanted to ask Mike a few questions and he was gracious enough to agree to an interview. We didn’t get a chance to cover his fiction writing, so please visit Mike’s website, Mike MacLean.net, to read some of his work and learn more about the man. First off, please tell us a little about your background. I think most people know you because of Sharktopus, but you also write crime fiction. What led you to the world of Roger Corman and Dinocroc vs. Supergator? Thuglit, a very cool crime fiction website, published my story “McHenry’s Gift.” To my surprise, The Best American Mystery Stories then picked it up for their 2006 edition, where my name appeared in the table of contents among legends like Elmore Leonard, James Lee Burke, and Walter Mosley. It was a huge honor for an unknown like myself. A short while later, I was approached by New Horizons Pictures, Roger Corman’s company. They dug “McHenry’s Gift” and wanted to know if I’d try writing screenplays. What would you say? 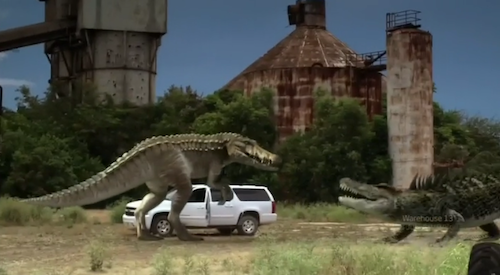 After working on a few scripts for them, I was asked to do re-writes on Dinocroc vs. Supergator. You’re credited on Dinocroc vs. Supergator alongside Jay Andrews. Can you tell us a little about that — did you and Jay co-write the script or was it a case of one writer being replaced by another? Jay Andrews is actually a pseudonym of veteran B-movie director Jim Wynorski’s (Jim himself mentioned this online, so I’m not revealing any secrets). He had an opportunity to film in Hawaii, but time was of the essence, and he needed a script fast. Dinocroc Vs. Supergator was something he had been working on. A rough first draft was complete, and it was fast-paced with a fun ‘80s vibe to it. But it also had some holes (as all first drafts do). I had less than three weeks to get it ready while Jim worked in pre-production. It was a ton of stress but a blast. Was that your first produced screenplay? Jim Wynorski is famous for his ability to get actresses to shuck their shirts. Were you on set to enjoy the benefits of that? Did you get to hang out with David Carradine or Eric Roberts (on Sharktopus)? And most importantly, we here at Cheese Magnet are big fans of character actor Mike Gaglio, who played “Fisherman” in Sharktopus. Did you get to knock back a beer or two with Mike? No, I didn’t knock back beers with David Carradine, Eric Roberts, or the infamous Mike Gaglio. And no, I wasn’t on set to witness any actresses popping their tops. In fact, I’ve never been on set during any production. Sorry to burst your romantic illusions. My career as a screenwriter has consisted mainly of me sweating in front my computer, hammering the keyboard like a monkey while downing mass quantities of Amp energy drink. This may sound like hell to some; to me it’s heaven. My one brush with glamour occurred as I wrote the first draft of Sharktopus. Roger Corman arranged to have me attend the Puerto Vallarta film festival so I could check out some locations they wanted to use in the picture. I’d talked to Roger many times over the phone, but had never met him in person until then. I had an amazing meal with he and his wife/co-producer, Julie, at a stunning resort. They were very gracious as I pestered them with questions about their careers. Then I attended a glamorous film festival party full of hip, beautiful people, many of whom didn’t speak English. I grinned and nodded my head… a lot. How did Sharktopus come about? It’s a great title — was it a spec script, an assignment, or did somebody just say “Sharktopus” in front of Corman one day? 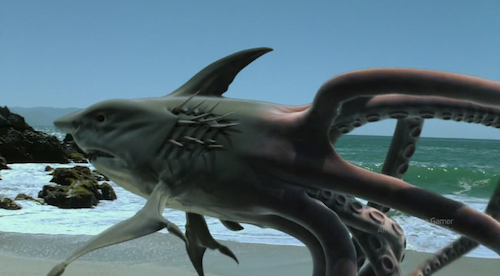 The title Sharktopus came from Syfy. They pitched the idea to Roger Corman, who thought up the basic plot then asked me to punch up the script. What kind of leeway were you allowed in writing the script? Were you given a strict outline to follow? I understand the SyFy Channel has a pretty rigid structure they like their movies to stick to. Syfy does have a very rigid structure, designed specifically to keep viewers from flipping the channel. They want the creature revealed in the first five minutes. Then they want some creature action every eight to ten minutes thereafter. In addition to those guidelines, I was given pages and pages of notes regarding changes to be made to each of my drafts. So my freedom was somewhat limited. I think that’s pretty common when working with a big company like Syfy. And it’s understandable. They’re the ones paying the bills after all. How much of what you wrote actually made it to the screen intact, or at least reasonably close to the way you envisioned it? In the script, Sharktopus’ tentacles weren’t razor sharp (instead Sharktopus ripped some of its victims in two). Also, the final scene was quite different than it appeared on the page. And, as to be expected, some dialogue was cut here; some was added there. But for the most part, the film followed the script pretty closely. 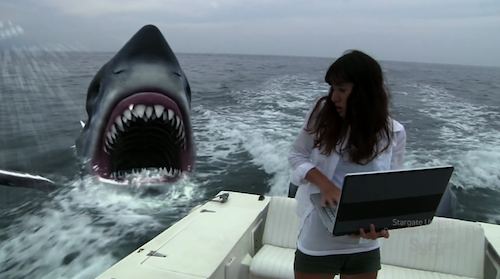 Were you surprised at the way Sharktopus became such an Internet phenomenon? Everybody on Facebook and Twitter was talking about the movie and linking to the trailer. The buzz surrounding Sharktopus surprised everyone. One day, a Syfy executive tweeted about it. The next thing you know, the word “Sharktopus” appeared on sites and blogs all over the web. And the buzz wasn’t confined to the Internet. I remember working on script-revisions during production and finding out that the Late, Late Show’s Craig Ferguson was going off about Sharktopus in his monologue. It was crazy. The movie hadn’t even been shot yet, and people were already talking about it. That’s rare for a Syfy original. If I’m not mistaken, you live outside California. As a fellow screenwriter living outside of Hollywood, I know it can add an extra layer of difficulty to the job — how do you deal with it, and has it caused any appreciable problems for you? I’ve talked with a few screenwriters about this issue and they’ve all said the same thing: “If you want to make a living writing screenplays, you have to live in LA.” For the most part, they’re right. I envision that many movie deals are born out of simple conversations that start at cocktail parties, or coffee shops, or at lunches. If you’re there to take part in the conversation, you stand a better chance at getting the job. I live in Tempe, Arizona. I make my living as a high school teacher, not as a writer. If I lived in Los Angeles, I might get more work. Who knows? Quite frankly, I’m lucky to have gotten any film work at all. As I mentioned before, Roger Corman’s company discovered my work and offered me the opportunity to write for them. I don’t think that happens very often, and I feel very fortunate and grateful. Hopefully, my answer doesn’t sound pessimistic to non-Hollywood screenwriters. Truth be told, nothing I say should really matter. You should write because you love it, or because something within you propels you to write, not because you believe it will make you rich.